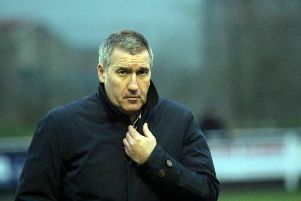 Banbury United boss Mike Ford wants to galvanise everyone connected with the club after this week’s setback. The Puritans were docked four Evo-Stik League South points following Monday’s ruling by the FA and Ford wants to see a positive reaction. United entertain Redditch United looking to make it six home wins on the spin and maintain their excellent form at the Banbury Plant Hire Stadium where they are unbeaten in eight games, having scored 20 goals during that run. Ford said: “I feel we’ve been harshly treated but it is what it is and we move on. ‘We are United’ is our hashtag and that’s what we need to be over the next few weeks, with everyone getting behind the team home and away. “During my tenure as manager of this great club we have overcome many obstacles of which this is another and I’m sure there will be more. “We must now stand as one, and once again push on as we have done over the last three years. “There’s no time for us to feel sorry for ourselves, it’s no fault of the players but I’m sure it will drive them on even more to get as many points between now and the end of the season. “Our first opportunity to do that is on Saturday against Redditch and that will be an even bigger game for us now. “We’ve been getting reasonably crowds, especially during the winter, but it would be great to have 450-500 there on Saturday.